With The Avengers hitting the big screen in just a few short weeks, I thought it'd be a good idea to refresh everyone's knowledge of the different Avengers beginnings. With a couple exceptions, the movies seem to be pulling the character bios from the Ultimates series, so we'll be looking at the history of the comic versions of the movie characters from that universe. We're kicking this series off with Hawkeye. *Note* I added a section about the regular comic universe Hawkeye.Also, a couple of awful typos have been fixed. I meant to slam Green Arrow, not Green Lantern. Hawkeye, A. K. A. Clint Barton, is a convicted murderer, though the details of the murder are still a mystery. While serving his sentence, Barton was approached by none other than Nick Fury. In exchange for release from his sentence, Barton signs up to work for S. H. I. E. L. D. under the alias Hawkeye. Working many missions for Fury, he rose up through the ranks to become one of the elite black ops agents of S.H.I.E.L.D. After becoming a trusted agent, Fury had Barton pardoned and his criminal history erased and replaced. Seizing this opportunity at a clean slate, Barton started a family with girlfriend Laura. They eventually had three children together, whom Hawkeye would call before every mission to simply say goodbye in case he didn't make it. (Don't worry, because he's such a badass, Hawkeye ALWAYS made it back). Following the event with the Chitauri, where he and long time partner, Black Widow, cleaned house against some Chitauri sleeper agents, he was promoted into the Ultimates. Barton's abilities are mostly human in nature. His heightened reflexes enable him to react quickly in all situations and he's been known to shoot six arrows faster than most people can shoot six bullets. Hawkeye is also known for using random hand held items as deadly projectiles, for example, his own fingernails. He is a master marksman who carries primarily a bow with standard arrows, but has some other arrows for various uses. Hawkeye has also been known to carry hand guns. 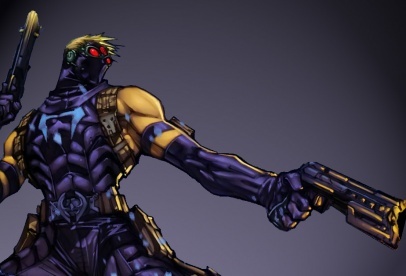 It's revealed later that Hawkeye's perfect aim is because of some modifications that had been done on his eyes. Hawkeye's personality is pretty much what you would expect of a black ops agent of his caliber. He's cocky, opinionated and often acts without thinking. Hawkeye also has no qualms about killing when necessary, which he has done and will likely continue to do. Like many of the Ultimates, Hawkeye's Ultimates background ground differs from the regular comics'. 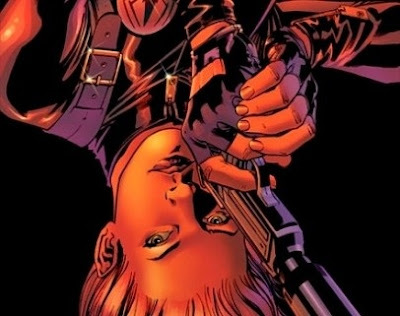 Clint Barton was originally orphaned as a young kid. He and his brother spent time at an orphanage until they ran away with a travelling circus. Under the tutelage of Swordsman and Trick Shot, he became an accomplished archer. Using the name Hawkeye, Barton became a star attraction for a couple circuses until he saw Iron Man being heroic. Iron Man as his inspiration, Hawkeye decided he wanted to be a costumed hero. As far as personality goes, the big difference between this Hawkeye and Ultimate Hawkeye is that this Hawkeye will not kill anyone for any reason. That's Hawkeye in a nut shell. He's probably one of my favorite Avengers, just by nature of using a bow. And he's got something going on that Green Arrow just doesn't. You know, being awesome (yeah yeah yeah, give me all the flak you want). Next time we'll be looking at Black Widow and certainly not thinking about Scarlett Johansson.